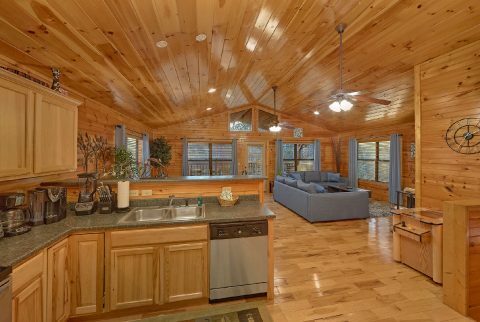 Your search has ended for a Gatlinburg cabin with theater room and phenomenal views! 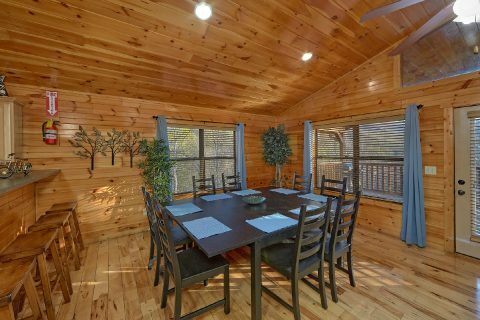 "I Love View" offers vacationers to the Smokies a gorgeous 2-bedroom Gatlinburg cabin with a view in the Glades Gatlinburg area. 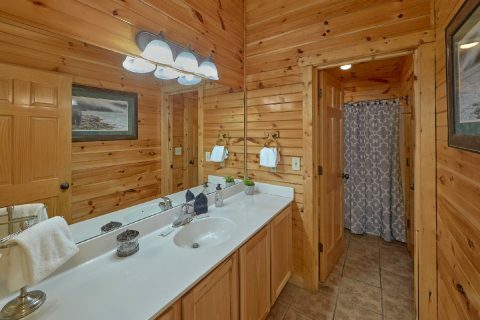 Picture yourself in one of this cabin's several rockers or in the warm waters of the family-sized hot tub looking out over the forest and mountains as the sun sinks below the rolling hills. 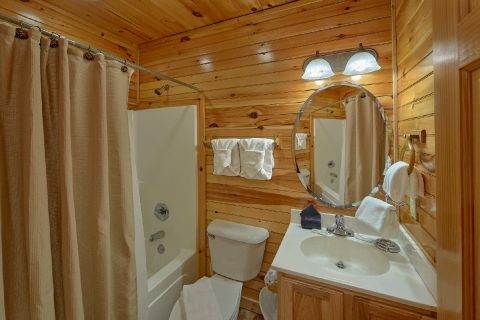 Your Gatlinburg cabin with a view offers great in cabin amenities to make you feel right at home. 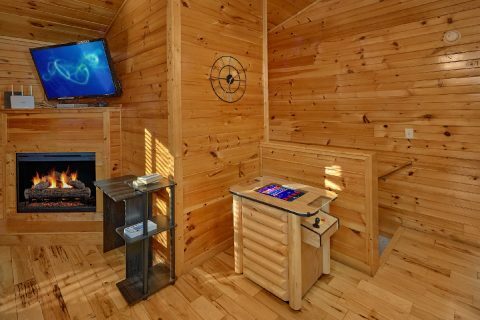 "I Love View" cabin's main level features a spacious living room with large flat screen television, electric fireplace, and plush seating. Stream movies and games on your free Wifi Internet. Everyone will love gathering around the large dining area to enjoy meals made in the kitchen with ample counter space and large breakfast bar. Host a cookout on the charcoal grill for food made with great outdoors flavor with the mountains as your backdrop. 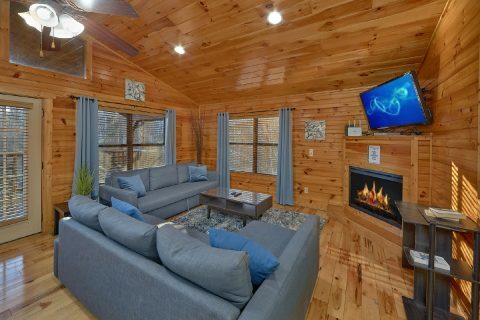 Back inside, this Gatlinburg cabin with theater room offers your family the movie theater experience in a private setting. Gather the family together and watch your favorite action-packed movie in hi-quality surround sound. Don't forget a big bowl of popcorn or some sweets to go along with this great in-cabin movie theater! 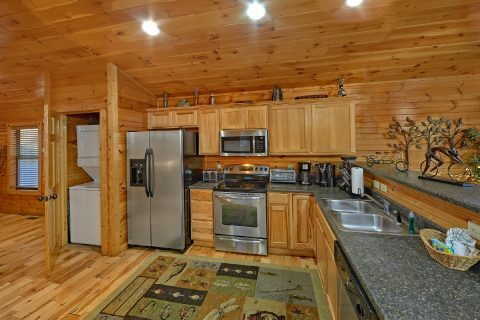 Like most our other cabins in the Glades Gatlinburg, "I Love View" is designed to make you feel at home with additional amenities such as, a game room with pool table for a little friendly competition and washer-dryer for your convenience. 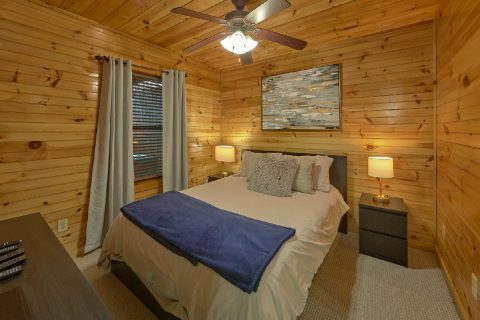 When it's finally time to turn in for the night, this Gatlinburg cabin with theater room offers two bedrooms (one on the main level and one on the lower level), which each feature comfortable king-size beds, a full bath, and a flat-screen television. 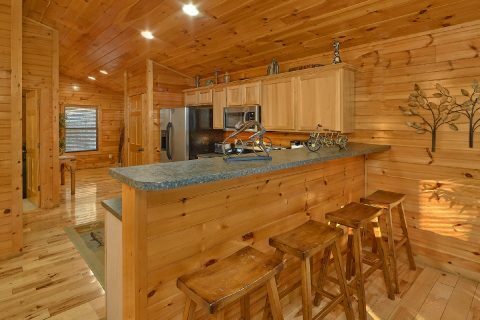 The main level master even boasts its own fireplace. 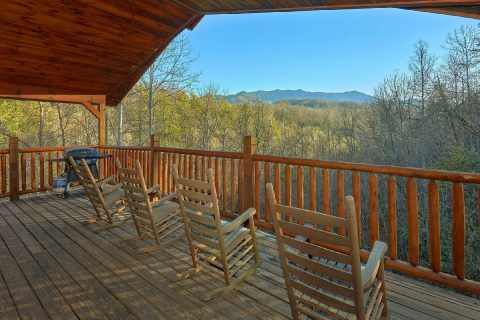 If you think the photos of the views are awesome, come enjoy the real deal when you reserve this Gatlinburg cabin with a theater room for your family vacation in the scenic Tennessee Smoky Mountains! 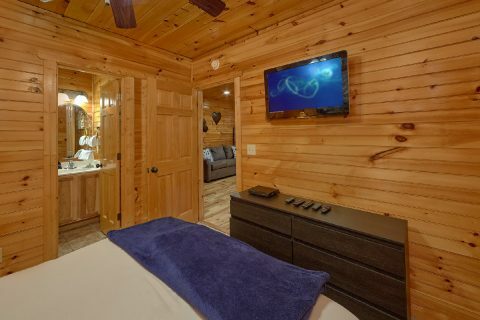 Don't forget, when you book your Gatlinburg cabin with theater room or any of our cabin rentals in the Smoky Mountains online with Cabins USA, you get an immediate Online Cabin Discount!